Historical Marker #1846 in Richmond discusses James B. McCreary, a Confederate veteran who was twice governor of Kentucky. Born in Madison County in 1838, McCreary joined the Confederacy despite opposition from his family. He wrote, "I stand alone in my family, and arrayed in war against relatives . . . My parents are opposed to my going into the army and opposed to my politics . . . but I cannot stay in peace." McCreary eventually became lieutenant colonel of the 11th Kentucky Cavalry and led troops under John Hunt Morgan. He fought in many raids and skirmishes and was incarcerated in the Ohio Penitentiary when Morgan's Raiders were captured in Ohio. After the Civil War, many Kentuckians supported ex-Confederates for political positions, including McCreary. He served three terms in the Kentucky legislature, where he was speaker of the house, and was elected governor in 1875. 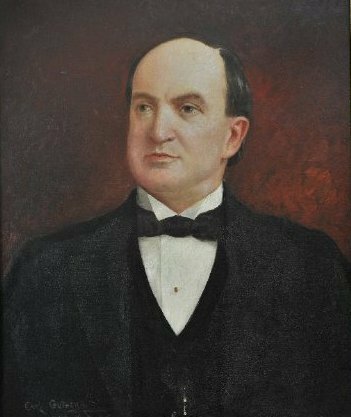 He later served in the U.S. House and Senate before again being elected governor in 1911. McCreary died in Richmond in 1918 and was buried there. McCreary County is named in his honor. Governor James B. McCreary: A native of Madison County, James B. McCreary was one of several Confederate veterans who became governor of Kentucky after the Civil War. Courtesy of the Kentucky Historical Society. Sanders, “Gov. James B. McCreary,” ExploreKYHistory, accessed April 19, 2019, https://explorekyhistory.ky.gov/items/show/21.